Video commentary: Surgeon General Regina Benjamin, M.D. U.S. 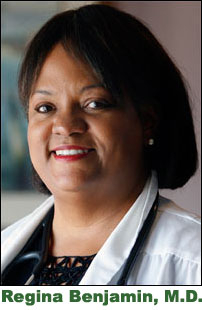 Surgeon General Regina Benjamin, M.D., spoke to attendees of sister publication Modern Healthcare's June 29 banquet in Chicago honoring the Top 25 Minority Executives in Healthcare for 2010. In this special video commentary, Benjamin, one of this year's honorees, talked about her humble beginnings and how those lessons apply to her work as the country's top physician. Watch the video.